Make your own ox cart the way the Indus people did. With a dozen activities, teacher's notes and templates. 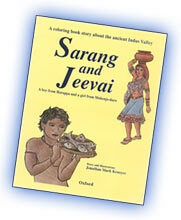 An Oxford University Press Publication drawn and written by Indus archaeologist Jonathan Mark Kenoyer.